OPEN: Sun - Thurs 4pm - 10pm. Fri & Sat 4pm - 11pm. Bridge of Allan is a historic spa town about one mile from the entrance to the University of Stirling and two miles from Stirling City Centre. It is a vibrant place with lots of thriving businesses from retailers, manufacturing and lots of restaurants of many types. The return of Rana Bassi to run this Bridge of Allan indian restaurant will only serve to add to the quality of places to eat in this small village. Rana's is part of the Bridge of Allan Merchants Association, the common voice representing over 60 local businesses. Below is a student video produced about Bridge of Allan. Rana's indian restaurant is just a short walk from Lyon's Cresent in Bridge of Allan where many international students live. - On orders over £15 (within 3 mile radius). Delivery charges apply to set meals. - To the University campus for orders over £15. 10% Student discount(collection only) on orders over £10. 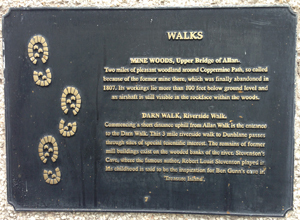 Bridge of Allan has 9 story boards located throughout the village for visitors to read whilst strolling through this historic Spa town before stopping off for one of Rana's speciality curries. Carry out menu now includes Italian Pizzas, Burgers and Turkish Kebabs.